Oh! One last thing. My friend Nevada pointed out his blog to me the other day—and I thought I’d link right on over to him. You might just find his theological thoughts of interest. I was shown this website by a coworker the other day, and, I have to admit, I really enjoy the satire. (Okay, technically, he just showed me the chart in the middle, which is funny in and of itself.) Not to say that I agree with the author’s conclusions—but he has some significant arguments that really do need to be dealt with. And, I think, he even has some good points, too. I’m working on my response—I’ll post it here as soon as I’m done with it. I’ve been trying to figure out how to fix this halogen lamp dimmer switch that I have. I burned out one of the transistors on the existing switch, and tried to replace it. Unfortunately, it still doesn’t work, and I have no idea how to even find out what is wrong. 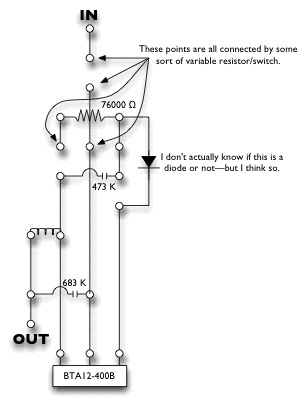 I’ve studied some electronics—but I can tell that it’s been too long since my circuits class at Dordt. If anyone has some suggestions or thoughts, please email me or add a comment. Even some insight as to what all might be going on in the circuit would be great—I was honestly just expecting a rheostat. Thanks much! Life in the status quo is all around. Folks who have set aside passions and dreams, content to make a big to-do over the smallest events of any given day. People who have entirely resigned themselves to whatever life might put in their path, a destiny controlled by a nameless force. Yet who am I to strive for something more? Can I not be content right here in the life God has given me, rejoicing in His blessings, praising Him for His provision, the health He has given, and the wonderful wife that I’ve been blessed with? Of course I can—and I think I ought to far more than I do. Is that the end of the question, though? I’m not always sure. I know that some of the greatest examples of a real, vibrant faith that I know of are those who have been beautifully content right where they were—no matter the situation. They didn’t try change the world; they strove to be faithful in the little things of life right around them, in their families, with their friends, and glorifying their Creator in the everyday-ness of life. It is truly some of the most beautiful obedience at its finest. It could be easy to end the discussion there. But I don’t think that really is a complete view of Scripture, especially when we look at the lives of those who have gone before. Paul could have been content to sit in the temple, teaching with zeal the traditions of Judiasm. Moses could have sat herding sheep for the rest of his years. David, even after slaying Goliath, could have ran away from Saul and been content in his cave—or even in another country. There is a critical difference, though—God called them to something more. And He worked mightily through them. Now, don’t get me wrong. This life is not about seeking to have a great impact on this world for God. That’s simply foolishness. In fact, I’ve heard it said that those who seek to have a great impact on this world—even for the best of reasons—are precisely those who probably shouldn’t. (That’s a painful statement for some of us…) This life is, however, all about seeking to obedient in whatever direction God has brought us (which may end up with an impact far greater than we can imagine). It is about hearing someday, “Well done, good and faithful servant.” (Matthew 25:23) I am to be content right here, where I am, striving to be faithful and obedient. If that very obedience ends up being larger than life, that’s His prerogative, not mine. And, as I find that He is leading me (and Rita and I together), we ought to follow that with all we are. Of course, it is hardly that simple, either. Taking up one’s cross (Luke 14:27) isn’t something that is ever easy or straightfoward. Being complacent (oh—how I wish I knew the difference between complacent and content!) is such a temptation, no matter where one is. Dear God—lead me in Your paths. Help me be content in You and in Your guiding hand that never fails. May You keep Rita and I far away from complacency—mold us to be sold-out and fully committed to Your call. Help us know that you are always taking care of us. We love you! Hello everyone! In the past 3 weeks or more David and I have been busy with a few projects. Mine mostly consist of learning how to scrapbook on the computer (as you can see in the photo’s file) and learning to sew a bit. I hope to take pictures of my projects so you can see them too. They are very much Rita style! :) As to be expected! David has been working on the web page so much that he hasn’t had time to even write for it! I can’t explain what he has changed as well as he can but a little of what I know I can share. You will notice there are “Table of Contents” under each of the Menu items. Some actually have something in the table of contents and some we are still working with. Also, notice the little jam jar by the address at the top of the page! pretty fun eh?! I’ll let David explain the rest. Other than that, we have had a couple of visitors this past month. That has been nice! I am volunteering again at Family Crisis Center this week and I hope to go and visit at Bethany Christian Services tomorrow. We love you all and miss you very much!! Mom and Dad are at camp this week and I’m wishing I could be there too! But since I can’t, David and I are hoping for a mini vacation together next month or so. Hi everyone! We just wanted to let you know that we have added another category of pictures to our “Photos” file. Lately I have been distracted with playing with some old photos and digital scrapbooking them. I guess in reality though it would be close to graphic design (is that what you call it?) I have the finished product posted on the “Two Peas in a Bucket” web site, but we’ve added them here too. Go to Photo’s and click on “Rita’s Pages.” Enjoy! I also want to let you know of how you can see Elizabeth’s scrapbooking too, she is my sister. She does an awesome job and also has them posted on “Two Peas” (she is the one that got me started). Take a look at her public profile. She does a really good job and they are a lot of fun to look at too. If you wanted to see mine on the “Two Peas” page instead of here, you can take a look at my public profile, too! So, now you know what I have been doing in my spare time, and sometimes even when my time is not too spare. :) Although I’m still not sure what to think of it, it has been an answer to prayer. Since I have been so restless lately being home alone all day without much structure, it has been nice to have something to occupy my mind and keep me busy. I like the work, but I am still working on design styles. I haven’t found something I like very well yet, but I did like what I did yesterday that was fun! :) Check it out! The other thing I just started doing last week was typing out my old journals. Starting at number one. Oh how embarrassing it is to read them ! I was 13 when I started. I used to say that I wasn’t boy crazy, but that isn’t the truth!! Every entry had some mention of a boy, often more than one, and every entry the boy was different!!! Sigh, the truth comes out! My only comfort is that some day when I have 13 year olds in the house, hopefully I will remember that I was one too, even if they don’t make any sense. I hope you are all doing well too. Don’t forget you can leave comments if you like, we love to get them!!! I believe that I have fixed the commenting function. Previously, the comment counts were not updating correctly. Help me see if it works by commenting on this post!